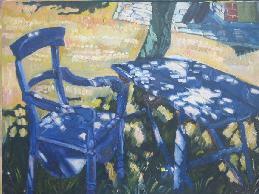 Learning how to paint dappled sunlight offers challenges in color mixing as some colour contamination is inevitable. But look at any Impressionist painting and dirty colours will be evident. It is the solemn colours that make the pure colour appear bright, as in the case of a sunlit scene. Pure colours are essential if bright and solemn colour mixes can be achieved. Recommended pigments (in oils, acrylics or oils) are: white, lemon yellow, cadmium yellow (pale), pthalo blue (or Winsor blue), ultramarine, permanent rose (or carmine red), viridian, burnt sienna and burnt umber. Other colours can be added. Several art brushes of various sizes are needed to dispense with the need to repeated washing between colour mixing. Soft brushes, such as sable sizes 3, 6 and 12 may come in useful. Larger fan brushes or (in the case of opaque paints) bristle brushes sizes, 6 and 12. Prefer the filbert to the flat, as these will not leave harsh brush marks. The preferred art surface (which might be watercolour paper, primed card or stretched canvas. Unless painting from life, a good quality photo is essential. Avoid bleached out images that give little visual information of the sunlit areas, and similarly, under-exposed photos that reveal little within shadow. Several photos of a sunlit scene would be better. The photo might ideally show dappled shadows over a lawn, patio table or figures beneath a tree. If painting from life, ensure there is plenty of time to capture the scene before the light changes. This often means speedy painting. When painting a scene that presents both bright colours and dark shadows, practicality dictates to begin with the bright colours. Unless working on a watercolour, consider applying a neutral-coloured underwash before embarking the painting, as this will reveal the true tonal value of any given colour. Bright yellow will appear heavy on a white surface. Burnt sienna and white; viridian, lemon yellow and white; cadmium yellow and white; lemon yellow, pthalo blue and white; lemon yellow, permanent rose and white or lemon yellow, ultramarine and white. Burnt umber and ultramarine; burnt sienna and ultramarine; permanent rose and ultramarine; pthalo blue and viridian; pthalo blue and burnt umber; pthalo blue and permanent rose. Varying amounts of white may need to be included if the mixture is too dark. Judge the shadow colour in similar way as the sunlit colours just mentioned. The softness of the half-tone – does the half-tone shift gradually from one tone to another, or does it veer sharply from dark to light? Gradual shifts can often be seen if the shadow is cast from far off, such as the uppermost branches of a tree. Is the half-tone smooth or patchy in its appearance, as can be seen if leaves cast shadows from close-by? Does the half-tone exhibit bright colours, or muted tones? Bright violet colours can sometimes be seen in dappled shadows, as can greys. Exploring various techniques for painting will help bring interesting effects to a painting of sunlight and shade. Mere alla prima (working on one paint layer) will often result in brisk and expressive brushmarks. Impasto can be used on the bright colours to make them appear to advance. Palette knifes can also add textures to the paint. Working in various colour dilutions of watercolour washes will create broken effects, particularly if some of the white paper shows through in places. Exploring the tonal and chromatic shifts of light as can be seen in dappled sunlight on a bright day offers various challenges in colour mixing and close observation. This means evaluating colour saturation, tonality and how one colour shifts from one to another. Often experimentation of painting techniques will create interesting and unexpected results. A productive session on art often means trying colour applications that do not always go as expected and learning from it. Why are there dull patches on my painting?